We would like to thank everyone who has helped make 2014 such an amazing year for LarsenGeekery. It has been a pleasure sharing our geeky interests with so many enthusiastic people. 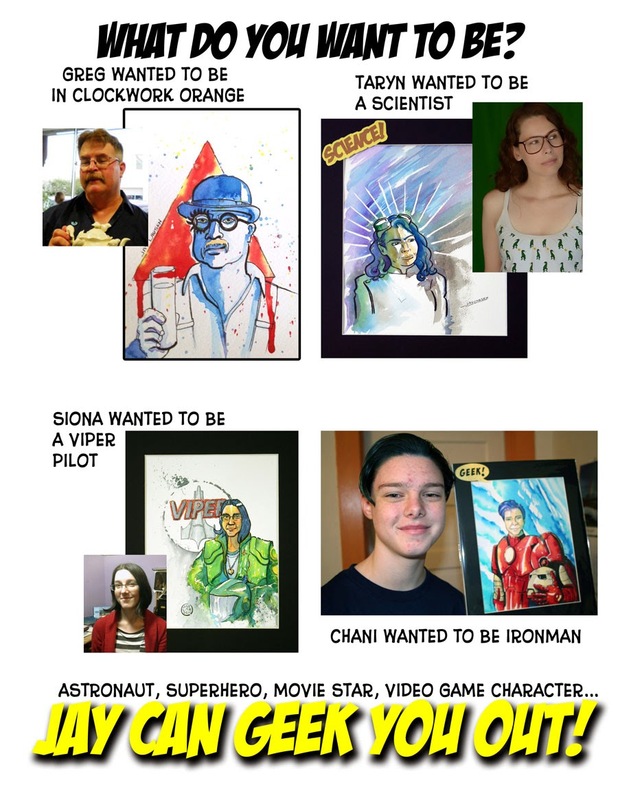 We have grown as artists and craftspeople and we are looking forward to growing and sharing even more Geekery in 2015. This has been a busy time for us as we have relocated to a new town and a new house with a much bigger Geekery Lab for us to paint and sew in (once we get everything out of the cardboard boxes)! We wish everyone out there a Happy Holiday Season. And we will see you in 2015 with new and wonderful Geekery for all. Visit our LarsenGeekery Store. Geekery delivered to your door. Or Like us on Facebook. Let the good time scroll! And now on Fine Art America The other FAA. 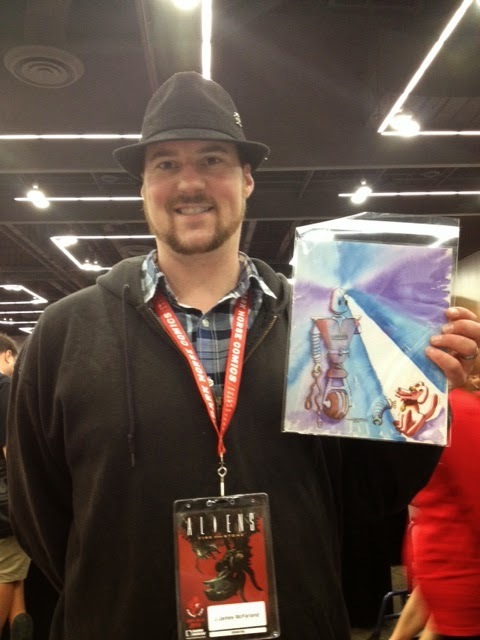 Rose City Comic Con in Portland was a ton of fun. We were in a small space, but I think we maximized the Geekery per square inch. 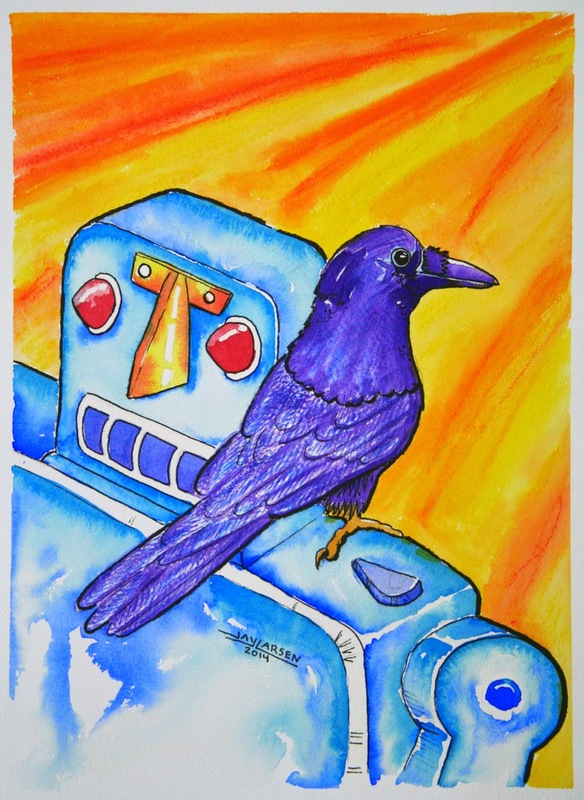 The new Robot Prints were a big hit! Evelyn in the booth. Selling bags and skirts! 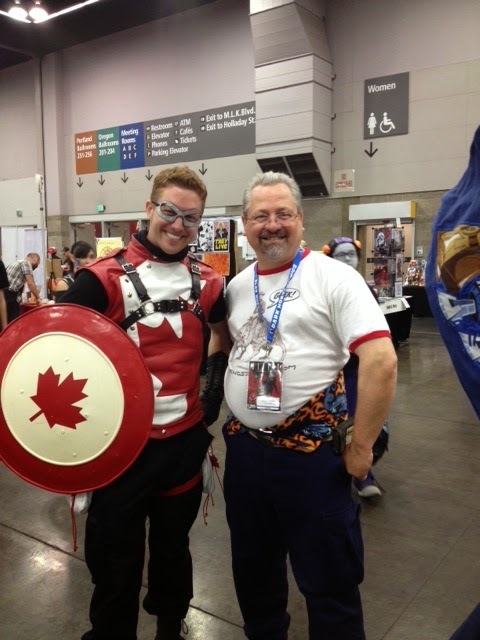 Had to go to Portland to meet Capt Canada! 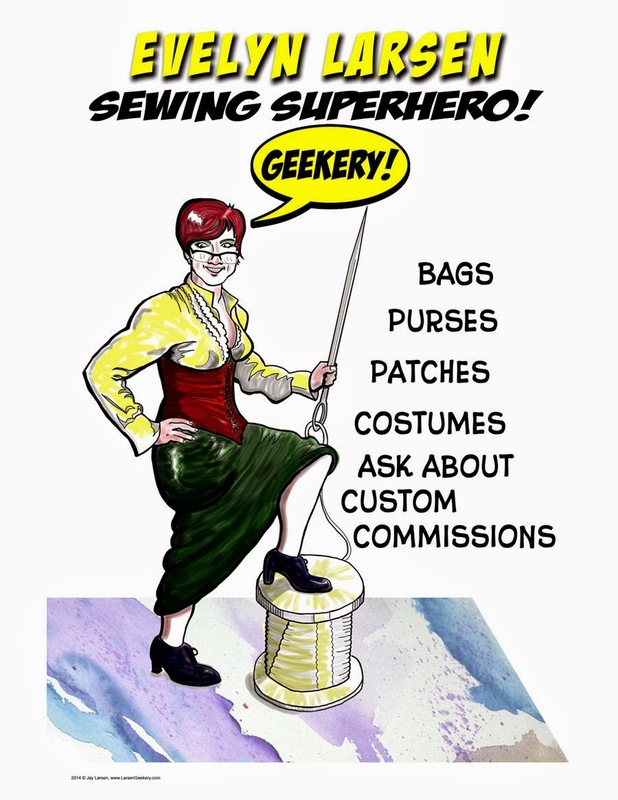 Our next show is Geek Girl Con, October 11-12th in Seattle. Booth 502. One of our most favorite shows every year. 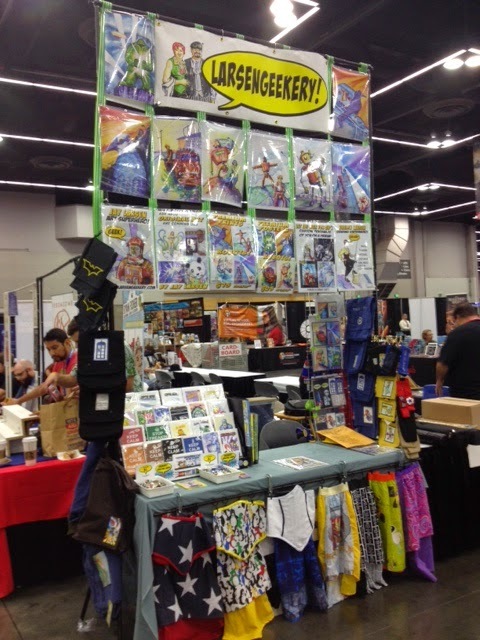 Geek Girl was our first Con, and still one of our favorites. Catch the show closest to you, or go to them all. I know we will. 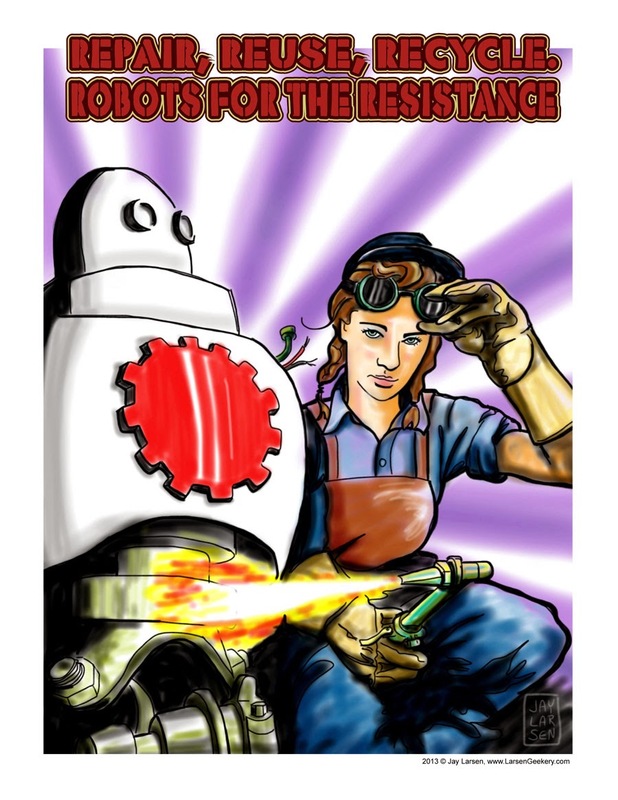 Wewease the Wobots! and Go to a Show! 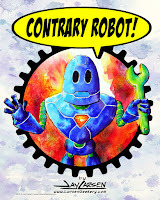 Let's try that again: Release the Robots! 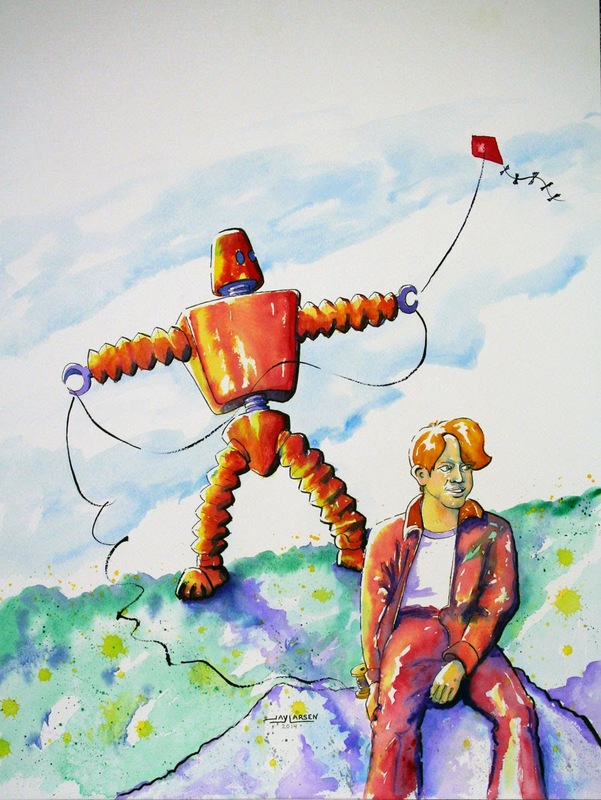 This year's show schedule features Jay Larsen's 2014 Robot Art and Evelyn Larsen's Geekery Gear. Resist the Bad News and Keep the Geekery Going. With all the bad news these days, a Geeky Attitude is more important than ever. Share something you love with someone who needs it--enthusiasm is contagious. Play, dance, sing, and make at least some of your day about the the things you cherish most. Geeky pluck can help us all resist the dark side. Go forth and Geek! 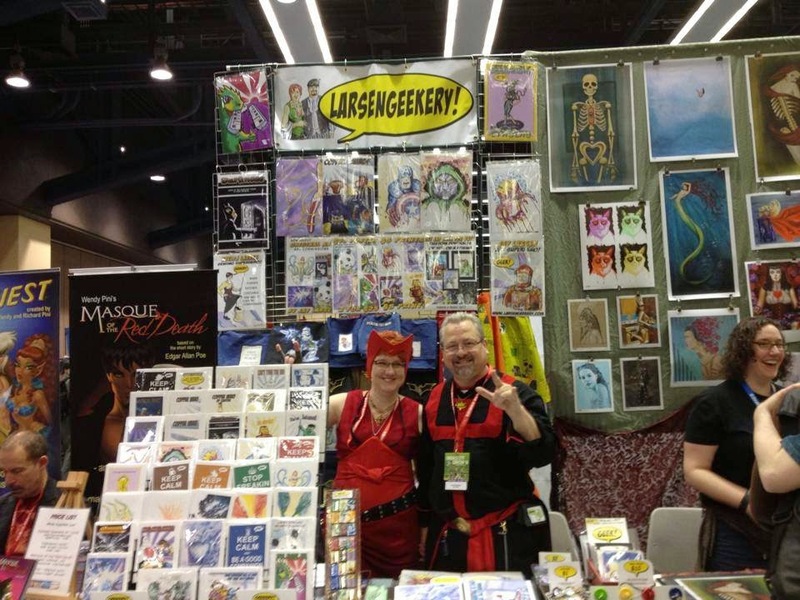 When Evelyn and I started LarsenGeekery we decided we had done enough things because other people wanted us to do them and we needed to fill more of our time with things that we genuinely liked doing. It was a gamble and a risk, but I am very glad we took that risk. We have met sooooo many cool new friends and attended some fabulous events. And I have done something I have wanted to do my entire life, focus on making art. And I have grown so much as an artist in just the last few years. I have been doing commissions for people and selling paintings almost as fast as I can make them. I am positive that my best work is still in the future. But I want to thank everyone who has participated in this adventure so far, customers, friends, family and especially my one-and-only Evelyn. This is a great time to be a Geek! 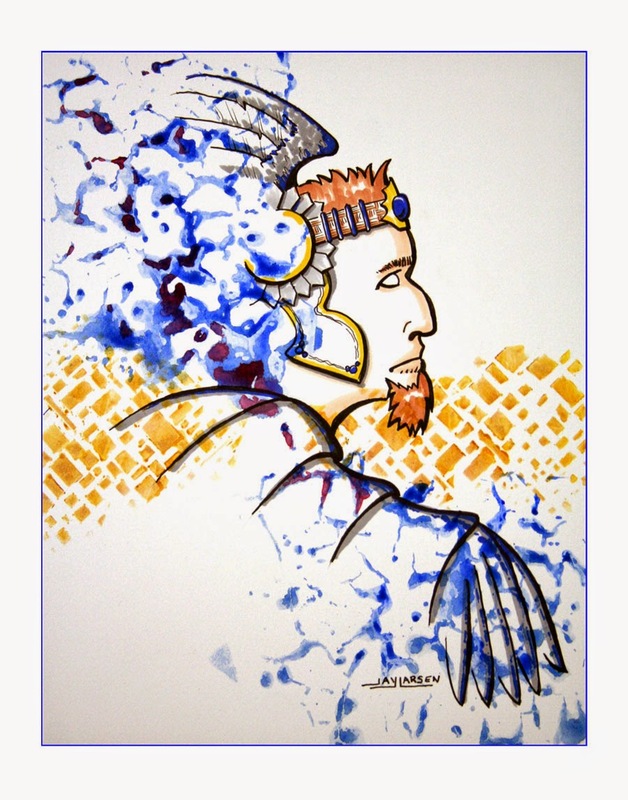 And now on Fine Art America where you can get prints and canvases and other fine art. 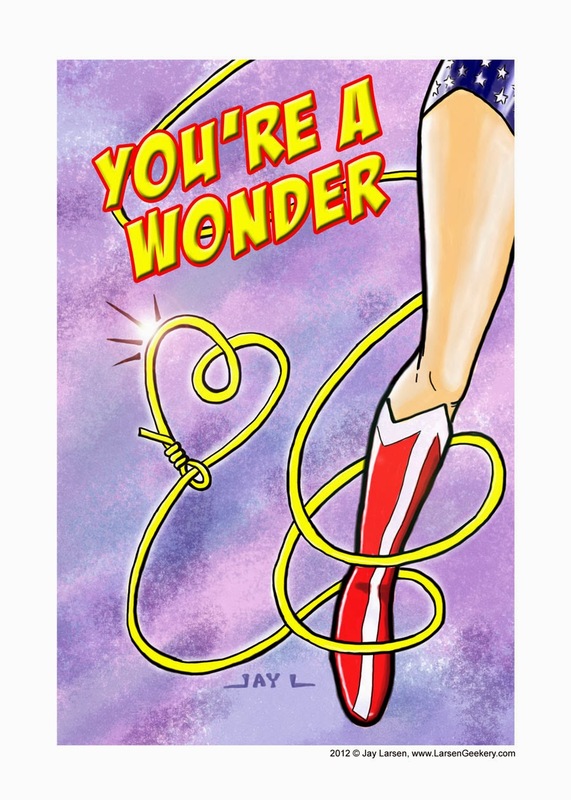 You can get Prints and Greeting Cards at our Etsy Store. 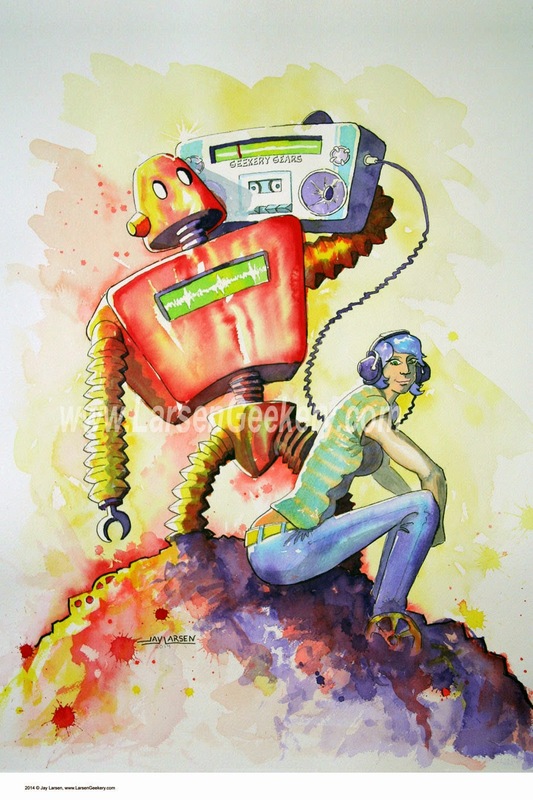 And the original 18x24" watercolor is available if you are interested. Evelyn has been working on some fantastic corsets and skirts. Evelyn and Jay will be at the Fremont Solstice Festival in the Parking Garage Craft Fair. Or Like us on Facebook. Facebook, way more fun than a Westeros wedding! Evelyn and Jay will be bringing their best Art and Gear to both shows. Oddmall is at the Everett Events Center and is FREE to attend. 11-6 both days. And everyone knows the Fremont Solstice Festival is a blast and a half! Emerald City Comicon was fantastic! 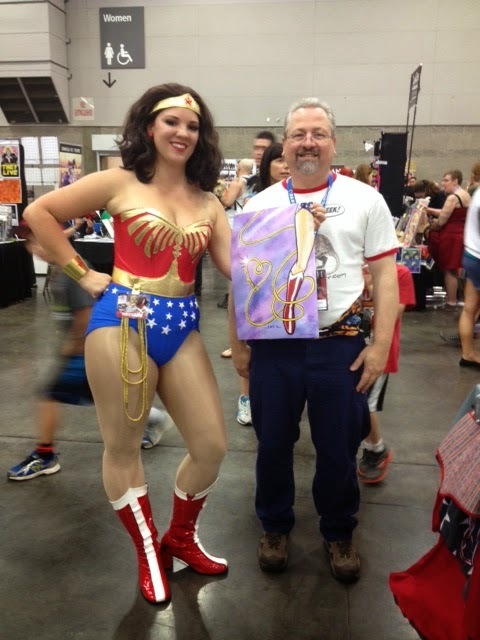 We had a great show and sold lots of art and Geekery gear. So check your calendar and plan to come to one or two of these incredible shows. The organizers of all of these events are great and put a lot of time and effort into making these shows fun for you and your entire family. Holy Cow! Emerald City Comicon 2014 is in just a few days. The LarsenGeekery Lab is full of hustle and bustle as we mix up some last minute Geekery for all you lucky people who managed to get tickets to this Sold Out Event, all 65,000 of you. We are super excited, but trying to play it cool. Join us at Artist Alley E-10. Can't go to the Show? Well you can still visit us at our LarsenGeekery Store. And order a custom portrait while you are there. We will be in Artist Alley E-10 with lots of great stuff (and lots of stuff that's not available online). Visit our LarsenGeekery Store. We sell. You buy. Everybody wins! March 28-30th 2014, is Emerald City Comicon 2014 in Seattle WA. It is one of the biggest Comic Book Conventions in the world and the biggest show LarsenGeekery is doing this year. We are pretty excited. We will be in Artists Alley Table E-10. So we have been hustling around the Geekery Lab cooking up some great gear: Patches, Bags, Greeting Cards, Prints and Posters. So if you are going to the show, be sure and stop by and say, Hey! We will be right next to the Elf Quest Team! Visit our LarsenGeekery Store. Buy Geeky Stuff. It will scratch that itch. Or Like us on Facebook. Book 'em, Face-O!. 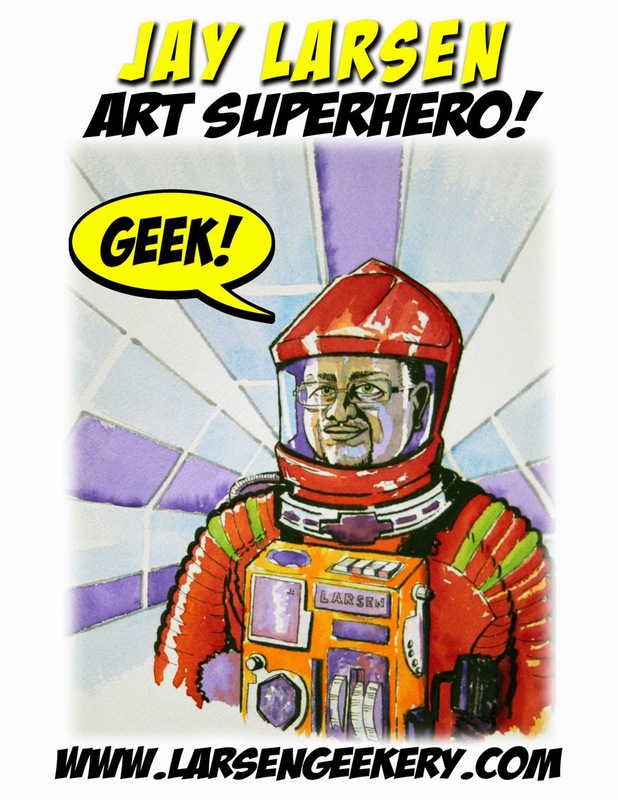 That's right, we here at the LarsenGeekery Labs are really Superheroes! We will be in Artist Alley with lots of great stuff (lots of stuff not available online). Visit our LarsenGeekery Store. Buy Geeky Stuff. You'll feel better. We'll feel better. Or Like us on Facebook. Face the Book. 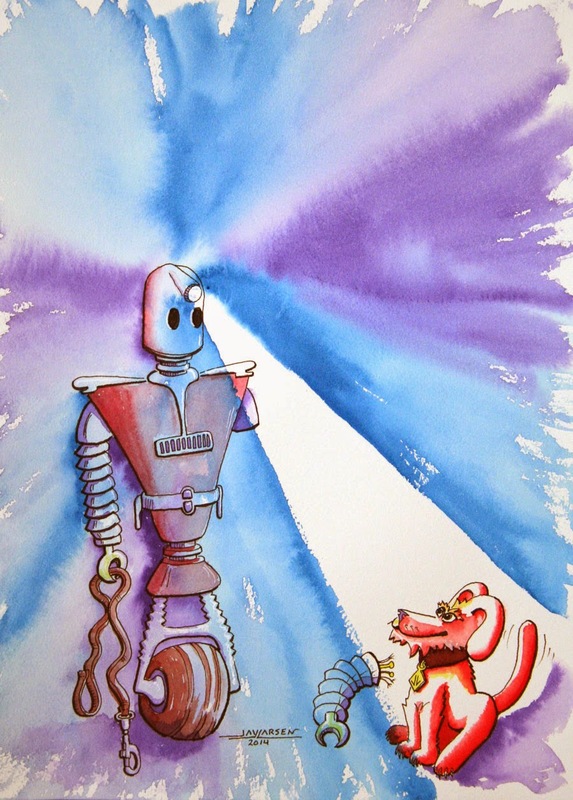 Lucky for you, Jay's latest watercolor painting is available on Etsy--CLICK NOW. 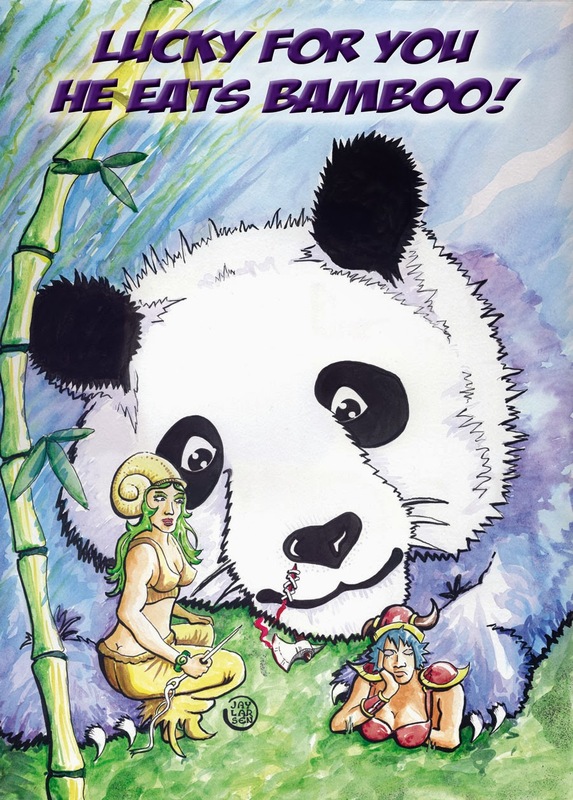 It's a beauty and tells a tale of fairy warriors and good natured pandas. 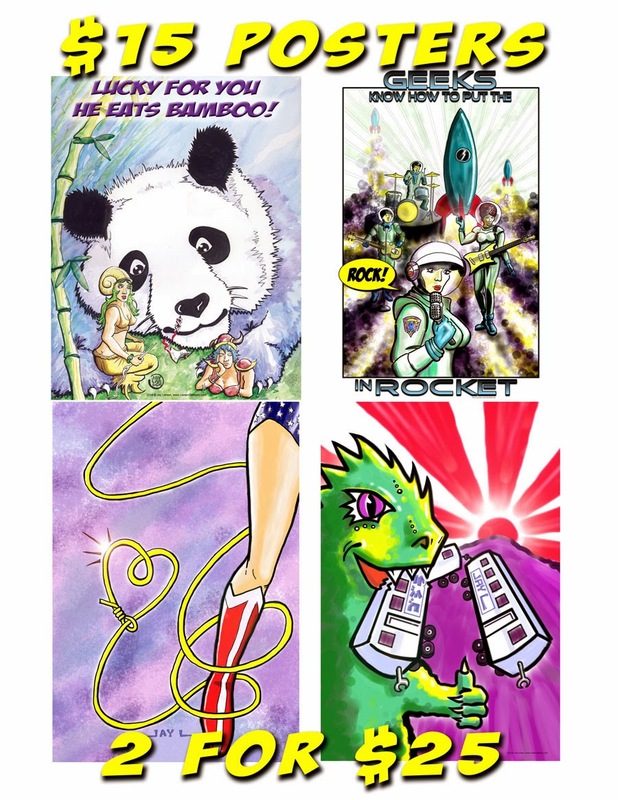 There is only one original, but Lucky for You there are lots of greeting cards. They are smaller than the Giant Panda original. 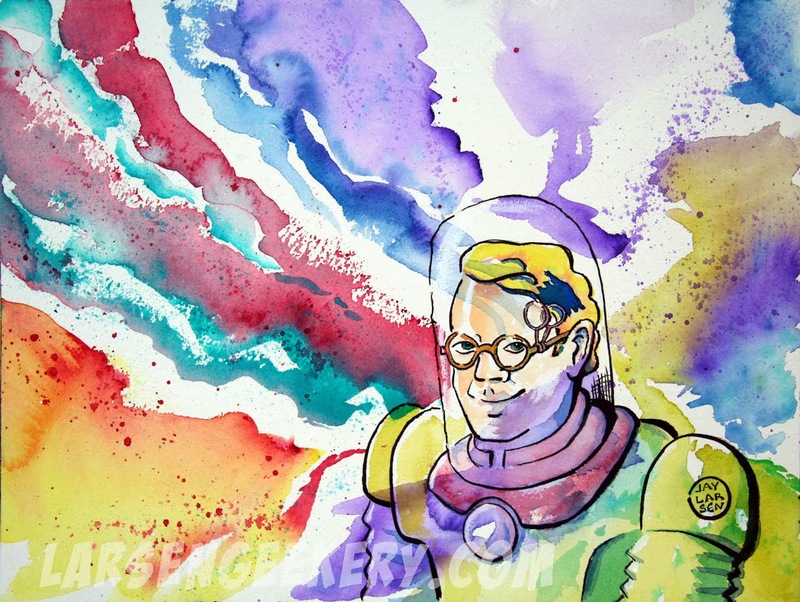 And they won't impress nearly as much as hanging a LarsenGeekery original on your walls. But they are easier to pop into the mail. Go get a Card or two! 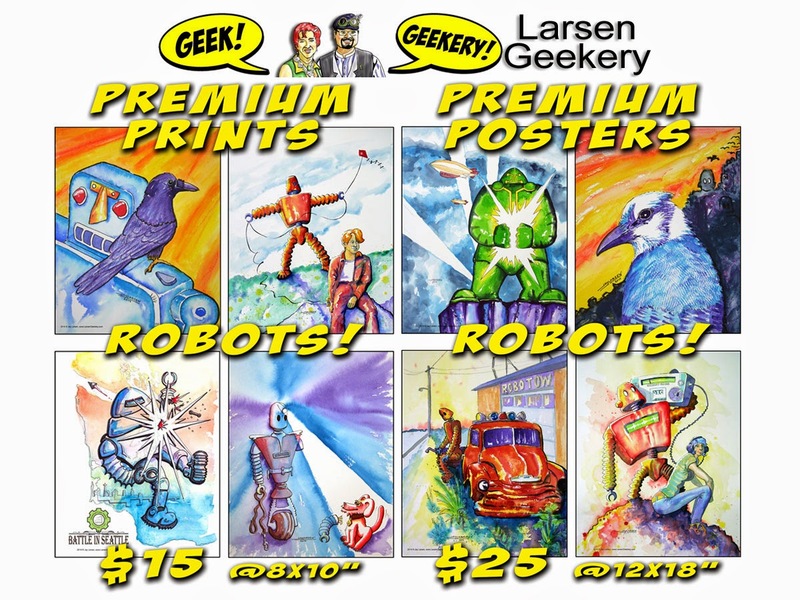 There are lots of Cards, Original Art, Posters, Bags and more, all on the LarsenGeekery Etsy Store. Or Like us on Facebook. Face it, it's not a Book. But we Like it anyway. 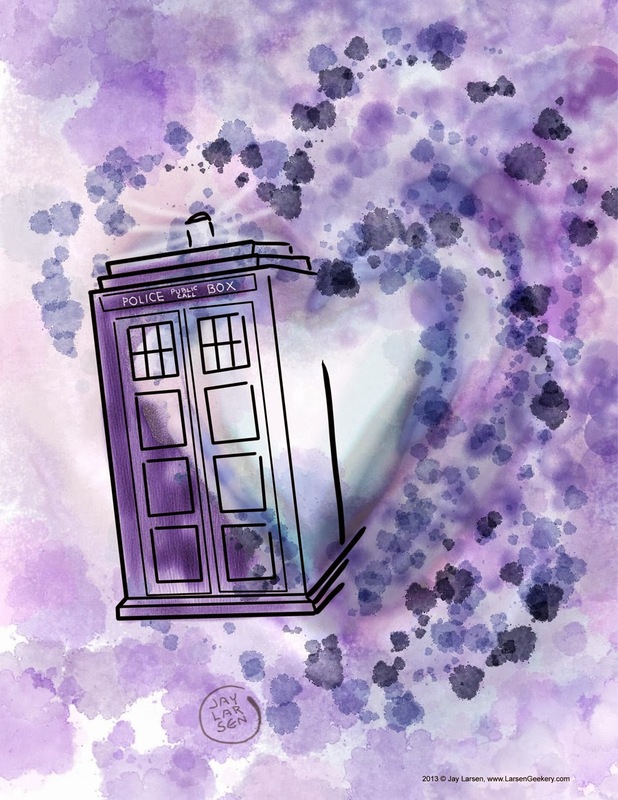 We have some great Valentines Day Cards for the Doctor Who fan in your life. Go Get Some Geeky Good Stuff at our Etsy Store. We will be in Artist Alley with lots of great stuff. Or Like us on Facebook. It's not very book-like, but you can see our faces. You Can Own The Originals. But you've got to be fast, because there is only one original of each piece. 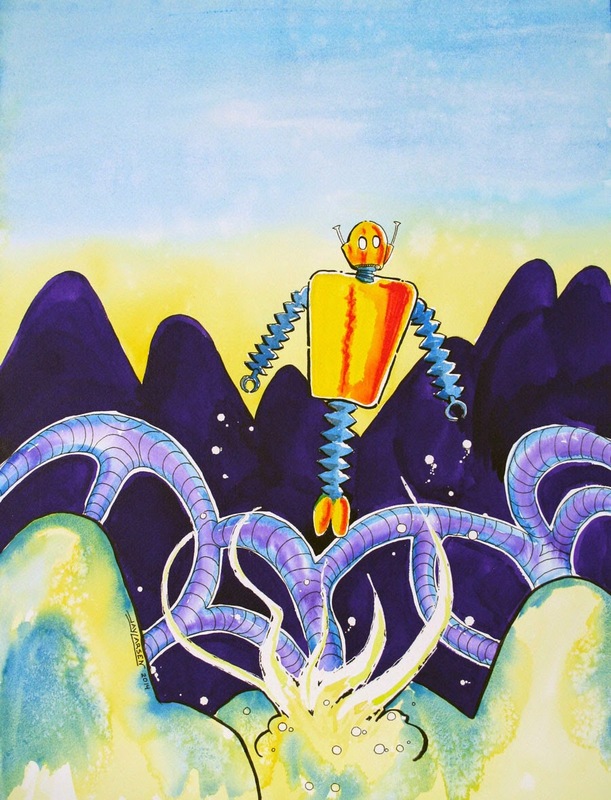 Check out the Original Art Tab at the top of this page to see new paintings. 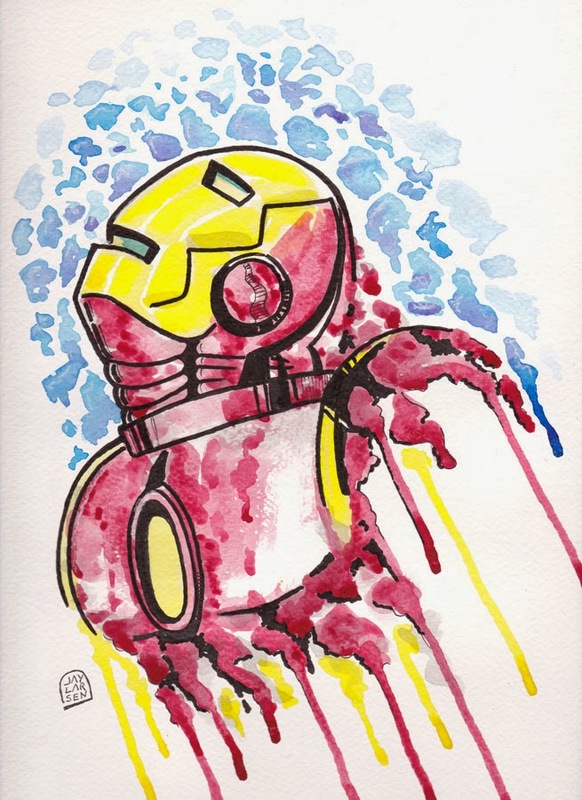 And then visit the LarsenGeekery Etsy Store and click Original Art to see paintings that are still available for purchase. 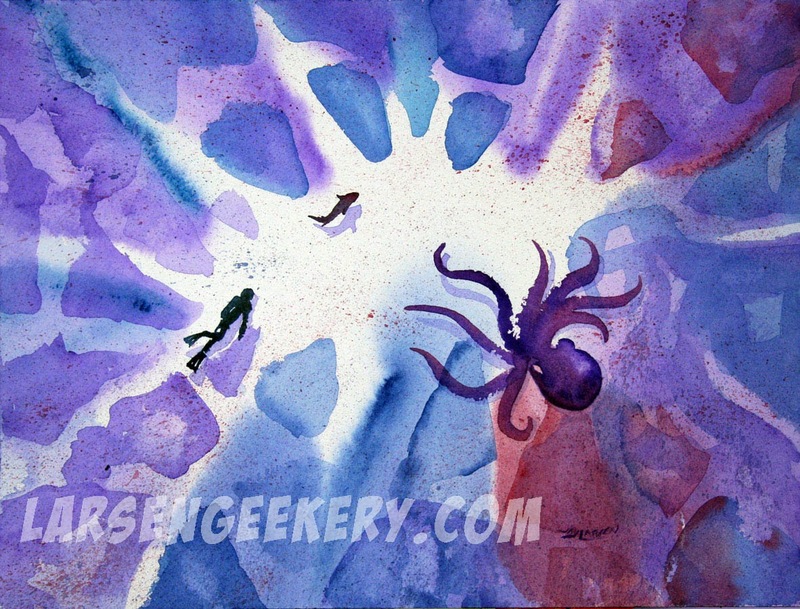 I hope you will enjoy owning fine Geekery Art as much as I enjoy creating it. If you purchase an original painting, rest assured you will be receiving a quality work of art hand crafted with care and enthusiasm. 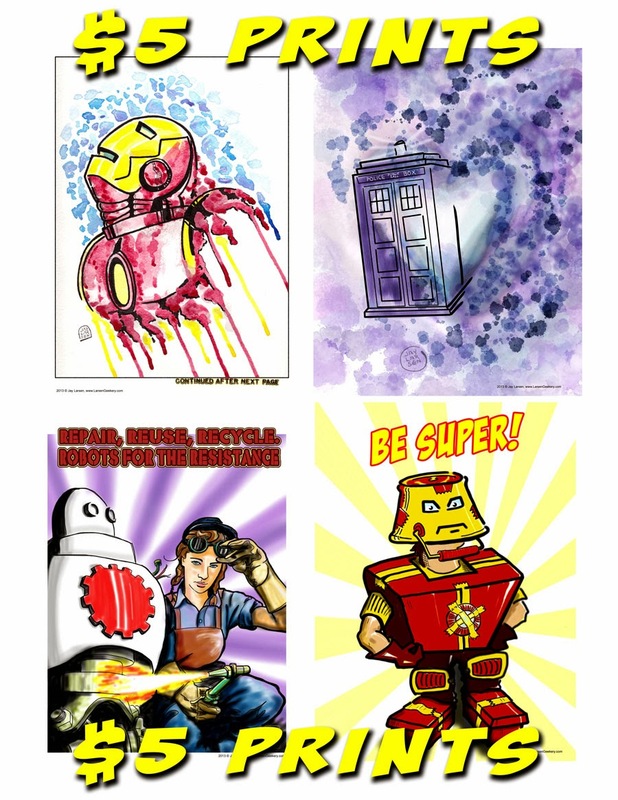 These are not mass produced copies made by a machine, but the ultimate in Geekery, original art. And you will be helping to support a living artist during the period of time that he needs that support the most--while he's still alive! Description: Prepare to be blinded by science! This retro scifi geek is ready to go where no man has gone before. Available: Yes, on Etsy--Buy Now! If you have any questions about Jay's art, please feel to Contact Us. In the meantime, Sign Up for our LarsenGeekery Mailing List. It's an email list. Visit our LarsenGeekery Store. But you know about that already. Or Like us on Facebook. Books are good. Books in your Face, even better. It sounds like Emerald City Comicon 2014 is already getting close to selling out of 3-day passes. So if you are planning to go to the big show, you should Go Get Tickets Now. 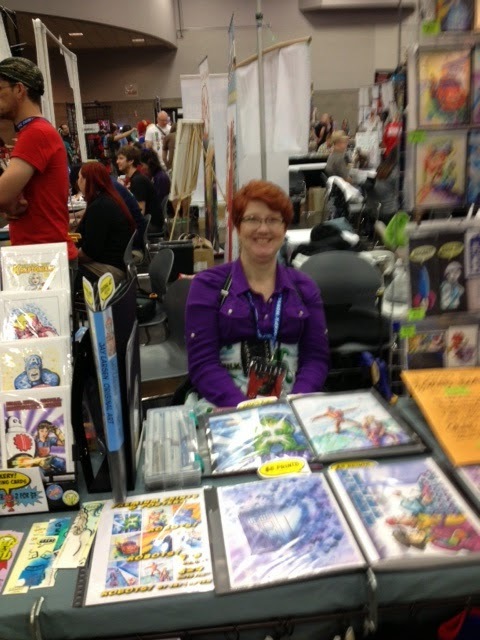 And you can come and see LarsenGeekery in Artists' Alley, if you have tickets. March 28-30th is not very far in the future.